Above: A wild male Red Hump Eartheater from Colombia. Photo by Sam Borstein. Species- steindachneri= Named after Franz Steindachner, a Geman icthyoligist. 'Geophagus' steindachneri is a beautiful eartheater type from South America that was first typed in 1910. What is unique about this fish is that it is one of a very few immediate mouthbrooders from the New World. There are three species in the Red Hump Eartheater complex, all of which show this neat breeding behavior. You will commonly see 'Geophagus' written in quotes like this because it doesn't represent the other Geophagus species. The true Geophagus species are those of the Geophagus altifrons, Geophagus brokopondo, and Geophagus dicrozoster types. The Red Hump group of 'Geophagus' will eventually be assigned to their own genus (Weidner, 2000). Geophagus steindachneris is highly variable throughout its range and quite possibly represents more than one species. *Note*- Since this fish was typed in 1910, it has been known to science and the hobby for a long time. One problem is with the name. This fish was found by two other biologists who thought it was a different species. One named it 'Geophagus' magdalena, and the other named theirs 'Geophagus' hondae. The other two Red Humps listed above, 'Geophagus' crassilabrus, and 'Geophagus' pellegrini are also confused with 'Geophagus' steindachneri. Although these three species don't look anything like 'Geophagus' steindachneri, exporters usually mis-identify and label them. In fact 'Geophagus' crassilabrus, and 'Geophagus' pellegrini are almost un-heard of in the USA. 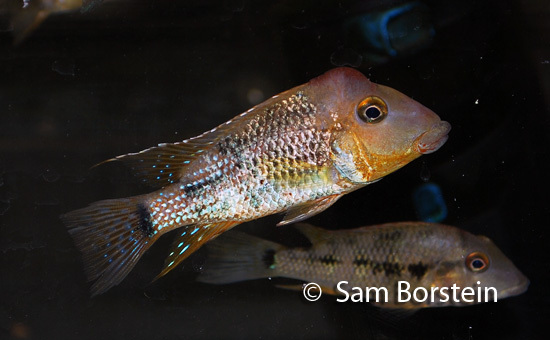 'Geophagus' crassilabrus is available occasionally from serious whole salers, but there are virtually no 'Geophagus' pellegrini in the US. This is because 'Geophagus' pellegrini comes from Colombia, and with Colombian political un-rest, it is difficult to collect there and bring back fish without getting killed. 'Geophagus' steindachneri is found throughout the Magdalena River and its drainage in Colombia, and throughout other parts of South America. 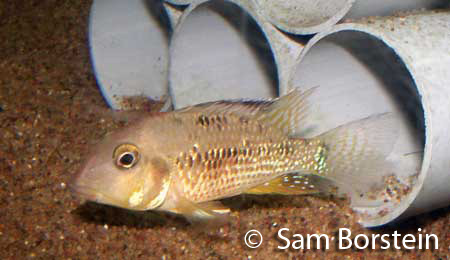 Above: A young male 'Geophagus steindachneri' "Nieva". Photo by Sam Borstein. Sexual Dimorphism: Males are larger than females and develop a large nuchal hump. Males also have spangles on their flanks and develop red dots on the corners of their mouths. Above: A wild holding female 'Geophagus' steindachneri from Colombia. Photo by Sam Borstein. 'Geophagus' steindachneri is easy to care for. This fish will do fine in a group of around 6-8 in a four foot tank that is well decorated. What is also nice about this fish is that it can tolerate many water conditions. They do real well in both hard and soft water, although I have heard some problems with people who keep them in well water. Red Hump Eartheaters are very active and will sift through sand or gravel all day looking for morsels. When larger, males can become extremely aggressive. They will kill other males and can be tough on females. I recommend keeping this fish over sand because that way you can see them sifting through the substrate, and see their behavior. They will do fine over gravel, but appreciate sand more. I've kept them over both. They also keep the tank nice and clean by digging through the substrate. 'Geophagus' steindachneri is omnivorous and will eat anything, including plants. They are a sand sifter and search through the sand for food. Sinking pellets are a good choice as the fish prefer to feed off the bottom, but flake food will suffice. 'Geophagus' steindachneri is easy to breed. Male Red Humps have red dots in the corner of their mouths that act as egg-spots in mouthbrooders. The male will shake and display these "egg-dummies" to the females. I believe these have a role in spawning and help facilitate in the movements the fish make to fertilize the eggs. Spawning occurs like in many other mouthbrooders. Females will lay one egg at a time which the male will fertilize and she will pick up. On rare occasions, males will also hold eggs. This tends to be common for the location variant "Nieva". 'Geophagus' steindachneri females are great parents. First off, these fish are great holders. Females hold for about 25 days. Then they release the fry. What is truly awesome is that the parents will allow the fry back in for about ten days. I recommend pulling the female and putting her in a separate tank (5 gallons) to see this behavior. Around 20 days I start feeding baby brine shrimp. This coaxes the fish to release the fry so they can eat. Around a week later I would net out the female, put her back with the rest of the parents, and raise the fry. Raising the fry is easy and they grow fast. At around an inch they begin to color up. 'Geophagus' steindachneri is a great fish, especially if you are just getting into eartheaters. This fish pops up in pet stores occasionally and is well known in the hobby, so keep your eye out for it. This is one of the coolest fish I've ever kept and one of my favorites. Weidner, T., (2000) South American Eartheaters. Cichlid Press, El Paso.